While we were on vacation in Hawaii last month, I found this awesome tool! And I had to buy it! It's meant for making pan sushi, which is basically made of ingredients that you would normally roll up in sushi, but spread out in layers inside a pan instead (and usually made with a layer of furikake instead of nori/seaweed paper), and then cut in squares to serve. So what was the first thing I made with this tool? 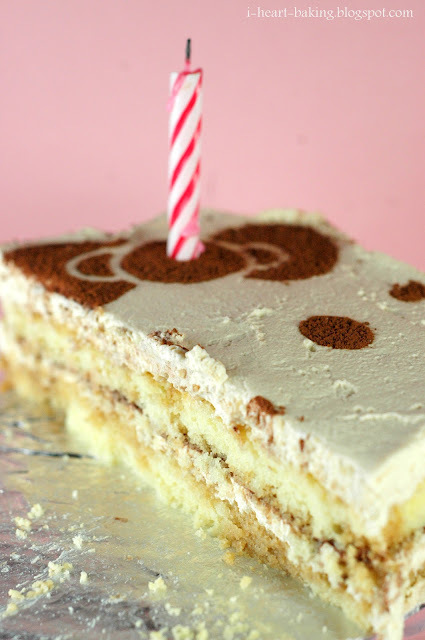 I made a Hello Kitty tiramisu cake! We were going to celebrate my mom's birthday a few weeks early since my brother was going to be in town, and since her favorite dessert is tiramisu I had been planning to make her tiramisu cake. And while I was unpacking all the goodies I had bought on vacation, I suddenly realized that I could use the pan sushi mold make the tiramisu instead! So I found a tiramisu cake recipe in my copy of Dorie Greenspan's book "Baking: From My Home to Yours". The cake layer was a sponge cake, which I baked in two 9-inch pans. While the cakes were in the oven, I used the mold to trace and cut out Hello Kitty on a cake board, which I then covered in foil. Then once the cakes were baked and cooled, I again used the mold to cut Hello Kitty out of the cake. I ended up using only one of the cakes, cut in half horizontally to make two layers, since both of the cakes together plus the filling would be taller than the mold itself. Next, I prepared all the components I would need to assemble my tiramisu cake - I made espresso extract, espresso kahlua syrup (which uses the espresso extract), and freshly whipped cream to lighten a mascarpone filling (which also uses the espresso extract, as well as a bit of kahlua for extra flavor). Once all of the components were ready, I placed my prepared cake board inside the Hello Kitty mold, followed by the first layer of cake. Next, I the brushed the cake with some of the espresso syrup. Then came a layer of the mascarpone filling, and then a dusting of cocoa powder (or you can use chopped chocolate). Next came the second layer of cake, brushed with more of the espresso syrup (on both sides). And then another layer of the mascarpone filling. This would be the top of the cake, so I made sure to smooth it out evenly with an offset spatula. And then the final touch - one last dusting of cocoa powder, using a Hello Kitty stencil, in order to bring Hello Kitty to life! The cake turned out light and moist, and full of tiramisu flavor. I think the kids liked the cake even more than my mom! Happy birthday, Mom! The cake was pretty simple to make, and we liked it so much that I made it again the following weekend for my friend Diana's belated birthday (since we were on vacation during her actual birthday!). I hope she liked it as well! Happy birthday, Diana! So petty and such a great idea. Buzzed! This is so cute...I would love to have a Hello kitty cooking tool like this! So cute! Does the stencil come with it? @MyFudo - you should pick one up! i bought it at marukai in hawaii, but they have stores in CA as well! I love all your Hello Kitty desserts...so pretty! Such an adorable cake! Your cake is too cute that I bought myself this mold just over the weekend and I've got all these ideas of what kind of cake to make with it. Question about cutting the cake with mold. Was the cake cut when it was still warm to touch or cool? I tried cutting my strawberry cake when it was still a tad warm and it crumbled. Also, did you split cake into 2 layers after it was cut into the Hello Kitty shape? Hoping to get some tips for my next try :) Thank you!! thanks @Jen L.! so glad you were able to find the mold! to answer your question, i waited for the cake to cool before cutting it. and, i cut it in half horizontally before cutting out the hello kitty shape. let me know how your next one turns out!!! The person knows cooking baking and crafting can easily send gifts to pakistan or any where from where he belongs. can i order this form for cake?